Cookies and chocolate and sweets than can easily be transported to the office are definitely the topic of the month at TWD. Great! I didn't make cookies in a while, so I was excited to go for these, Dorie's "Best Chocolate Chip Cookies". Chocolate cookies are definitely one of my favourites. To spoil it: The name of the cookies is no exaggeration. The recipe is really great! I opted for the cocoa-batter, because I like my cookies dark. Unfortunately I made some measuring failures. Again. And this time I can't blaim the lack of cup-measures, but only my clumsiness and improvidence. What happened? I made half the recipe, because 45 cookies sounds like a whole lot of cookies, and I made the wheat-honey cookies for next week, too. So 45 chocolate cookies where way too much. Everything went fine first. Until I did remember that I wanted to include the cocoa. So, what now. The batter was already finished. In my thoughtlessness I just included the whole amount of cocoa the recipe called for. Good idea, isn't it? Yeah. But now I had too many dry ingredients (abaout 50g or 1/2 cup too much flour). I wasn't sure if the cookies would work out like that. So I decided to change my mind and just make the whole recipe, and not only the half amount. Yes. Good idea. But how to beat butter fluffy, when there is already a ready-made batter in the bowl? Well, don't ask how I did it. I made a big mess in the kitchen, I absolutely scamped araound and made a big botch, but in the end I had a (very humid) cookie batter ready to bake. So I made chocolate chip cookies with not as much chocolate chips as there should have been. Or, to name it differently, I just strayed off the intented topic and missed the point. 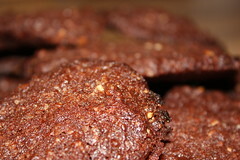 I have no idea how and why, but in the end the cookies turned nevertheless out very, very good! I am absolutely in love with these chocolate cookies and have to redo them, and redo, and do again, and try another playing around option (and include enough chocolate chips next time :o]). Thanks to Kait of Kait’s Plate who has chosen them! You can find the recipe on her page or in the book (p.68). They look chocolaty! Im glad you enjoyed the recipe! You'll never be able to recreate the delicious cookies you made now! I hope you are getting yourself some measuring cups in NYC. It'll make TWD easier for you. 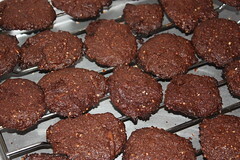 I made the original recipe and I enjoyed these, but found they were a bit thin.